Some spring days are better than others. Have a cup of coffee. We got down to the beach a little after sunrise. The water was flat and calm. But I knew that the marine forecast was predicting building winds, and wind waves, all day, with small craft warnings expected by late afternoon or evening. That is not unusual from autumn through spring here on the Olympic Peninsula, though we can usually see it in the forecasts ahead of time. By the time we got rigged up and headed down the beach you could feel the cold wind puffing up, metallic grey low clouds schooning along, and in the distant horizon on the water you could see the surface turning black. My fishing guest that day was oblivious to my quiet sense of foreboding. I had previously warned him that we might get too much wind at some point, that at best we had a 50:50 chance of a decent full day on the water. He decided to come out anyway. Fine with me. I would always be willing to reschedule the day if it went bad for us. It only happens a few times each year. Low tide and wind scalloped sand on a lee shore. At first it was fine, really. There was just a light breeze out of the south, maybe 5 to 10 knots, but with hints of more to come. And the tide was running with the wind, the water still flat. As we got to work fishing we positioned ourselves downwind of a high sand bar and some trees, where there was a seam of current eddying along the edge of quieter water behind the bar. As my guest began to make his first casts of the day I noticed right away that he was going to need a little coaching. And the wind was pushing in from his casting hand side. So we worked on that a little, an impromptu casting lesson. Keep the rod tip tilted slightly away from you, into the wind. Use enough hand speed and a sufficient enough stroke to overcome the wind blowing on the line. Use a crisp enough stop, straight toward your target, to direct all of the casting energy to the target. Immediately follow through after the stop, to follow the line down to the water with the rod tip, and to help keep the line out of the wind. And if it gets too windy, cast on your downwind side." Some people handle this better than others, and this guy was a gem- eminently teachable, athletic, and he learned quickly. If you can't cast in the wind you are going to miss a lot of fishing days. And even though the wind was building, and the waves were picking up out there, with white caps forming, he had a decent cast going and we were covering the water out to forty feet in front of us with very little difficulty. And then the wind really came on. By lunch time we were feeling gusts strong enough to make us stagger. Easily Force 4 on the Beaufort Scale. But under the darkening sky there were ominous gusts to well over Force 6. my guest did not mind a bit. No one had told him that he couldn't cast in the wind. So he just kept a positive attitude, ignoring the wind, and went right on casting. And from where we were, we had several hundred yards of "protected water" that was still fairly quiet, clean, and fishable. Force 4 on the Beaufort Wind Scale. And for our efforts, we were rewarded with one bright sea-run Cutthroat trout. And then the day blew out with spume strewn waves, silt and marl colored water along the shore, and casting was not realistic. And though it was not impossible to cast, it was no fun. We had to lean into it as we walked back up the beach. They say that if the wind were to stop blowing in Tierra del Fuego, all of the fishing guides would fall down. We were barely able to eat lunch as the wind increased. Hunkered in between some big beach logs, finishing our sandwiches and coffee, we called it a day. Well, a half day anyway. We went out to the cafe for some hot coffee. And I invited my guest to come back again someday, for a full "make-up day." We have over seven to ten months of good fishing ahead of us on these beaches, so I expect to see this man again this season. The promise of one bright, wild trout can do that to you. You should come fly fishing with me here this spring. I will keep an eye on the weather for you! April sea-run Coastal Cutthroat trout. We have been getting out a few times a week, scouting our north Puget Sound region beaches for signs of life. March here was very quiet for trout, which came as no surprise. For one thing we had record rainfall this March. And we also know that many of the trout are spawning then. And we have heard that in some streams that are being monitored here they are seeing the chum salmon fry coming out about a week or two later than normal. And this would concentrate the trout and the fry in the lower tidal reaches of many streams. (NOTE here that none of those places is open to fishing right now!) So through March we have seen "a fish here and fish there", and generally slow fishing. But things are changing now. Every single day. April magic. April is seeping spring into life here in a gradual awakening. You begin to notice that the air is heavier with the scent of things like the soil, low tide, pollen, grasses and flowers. That earthy richness is coming back with the sun's warmth. 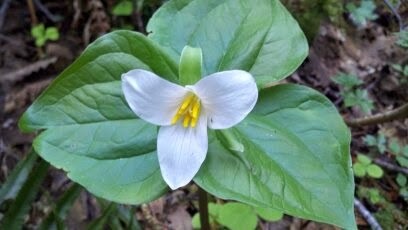 One favorite harbinger of spring for me is the trillium blooming in late March. By April the Red Winged Black Birds are back. And they are out in fully singing force here now. The trout are moving out of the creeks, along with the salmon fry. And with each tide they will gradually spread out into the tidal currents. Soon it will seem as though they are everywhere along our shores. And of course the trout are chasing them like crazy now too.The fry that emerged from their gravel redds in streams far to the south of us, in South Sound and Hood Canal waters, will be making their way along our beaches in the coming months. And there will be a growing procession of salmon smolt coming through here all summer. 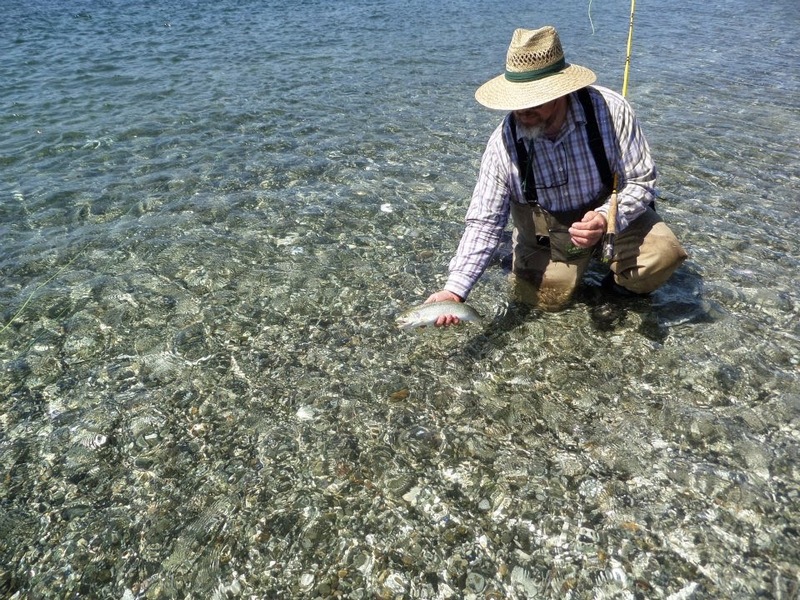 This just gets better and better through the season, and this is a big reason that this region is so popular for sea-run Coastal Cutthroat trout fishermen. Yes, size does matter. And smaller is better sometimes, when it comes to spring sea-run flies anyway. The fry come out of the streams at about an inch and a quarter to an inch and a half in length. So you should be tying your flies sparse and small- Size #6 to size #8, and maybe a few even a bit smaller. But don't think that you need a smaller tippet size now too. Some very big and robust trout come out into the saltchuck to play in the spring. I wouldn't fish for Cutthroat on the beaches with a tippet lighter than 4X now. Even on a size #10 fly. Presentation is everything. And if I can share one tip with you for spring time sea-run fishing, it is to work the shallow edges of things very thoroughly. Don't just wade out there thigh deep and bust out those long heavy casts. Try to hang back and work from shore a little too. Especially during much stronger tides and currents. Most of the action will be right at your feet, if you don't screw it up by walking into it all. It's time to get out there and fish! Speaking of flies . . . The Chum Baby fly is one of the most important fly patterns to have in your fly box when you are sea-run Coastal Cutthroat trout fly fishing, especially in the spring. You will find that this fly works very well for smallmouth bass, char and rainbow trout too, especially in waters where those fish feed on juvenile salmon. This is an excellent and long proven successful, general spring fry pattern. If you will be fishing in Alaska in the early season, you need this fly. You will soon find them at the Orvis Bellevue store! Dozens of Chum Baby flies have once again begun their migration across Puget Sound, over the I-405 Bridge, and all of the way upstream to the Orvis Bellevue Fly Shop! And you'll find them at The Confluence Fly Shop in Bellingham soon too. Just wait until you try the Chum Baby fly out on spring trout and Dolly Varden. I am guiding fly fishers on the Olympic Peninsula beaches, rivers and streams. We walk and wade, fly fishing for sea-run Coastal Cutthroat trout in freshwater and saltwater, and in the rivers for trout and summer steelhead. This is strictly catch and release, traditional fly fishing only. Lunch, snacks, soft beverages, and use of some equipment is included. I also offer personalized and private fly fishing and fly casting instruction for beginners. I would be happy to help you plan your Olympic Peninsula fly fishing adventure, for beginners through expert anglers. Public presentations, Naturalist guide, Rowboat picnics, Tide Pool and River trail day trips. Please call, write or email for booking details. Now booking for April through October and beyond. Please call or write for details.